Earlier this week, after quite a lot of drama, the environmental activist group Redline Tacoma announced that they would change their name in response to criticism over the term ‘Redline’ which has negative racial connotations. Names are important. One does not want to accidentally offend people. More importantly, one does not want to give off the wrong impression of what the company does…except when one does. The above photo was taken by City Councilman Marty Campbell this morning here in Tacoma. It’s a Dodge Charger with the letter BPS on the door. It clearly states that these letters stand for Border Protective Services. Contrary to any implication from their name, Border Protective Services does not have anything whatsoever to do with border patrol, immigration, or federal authorities. They are a local private security firm. What’s interesting is if you plug in ‘Border Protective Services Tacoma’ into Google you will not find them. Whether this is due to bad search engine optimization or due to a purposeful attempt to hid who they are is unknown. It actually takes quite a bit of looking to find any information online about them at all, which lends credence to the idea that their hidden digital footprint is purposeful. A search of Washington State companies shows that Border Protective Services was created February 21st of this year with an address in Spokane. One of the people involved in the company is listed as John Catterson. Catterson’s LinkedIn profile interestingly does not mention BPS. According to his profile he is a former special investigator for the United States Air Force and currently works as an independent contractor, a background investigator for the Spokane Police Department, and a Partner in Triple Lantern LLP. Triple Lantern has a LinkedIn profile, but the link to their official website leads to an empty page. The LinkedIn profile describes Triple Lantern as “Triple Lantern, a veteran owned small business is a full spectrum asset protection company structured to meet the investigative, assessment, education and protection needs of our clients. Founded upon the principle of relevant perspective, we strive to see the world through the eyes of our clients, and more importantly view your company through the eyes of your competitors.” It was founded in 2012. The other man involved in both BPS and Triple Lantern is Derrick Aalderts. I was not able to find much of anything on Mr. Aalderts. He does not seem to have a LinkedIn or Facebook account under that name. On ZipRecruiter.com there is a recently expired ad for a ‘Security Officers’ to work in ‘numerous locations throughout Thurston, Pierce, and King Counties starting at $13 an hour or just less than $2.00 an hour more than minimum wage. Requirements include no criminal history ‘that would prevent an applicant from obtaining an Armed Security License’*, two years of work history, a GED or High School diploma, a driver’s license, and an ability to work independently with minimum supervision. The ad also describes Border Protective Services using the exact same words used to describe Triple Lantern. To put all of this into perspective there is a private security company with no known offices or online presence operating in Tacoma paying their armed employees $13 an hour to work at unspecified areas doing unspecified things wearing uniforms and driving cars that identify them as “Border Protective Services” operating with a bare minimum of supervision in a city that happens to have a for-profit prison that houses over 1,000 illegal immigrants. Now before I go on there are a couple of other things I should mention. For the most part, private security companies and workers are a vital part of our society. Many of these men and women are highly trained military veterans with extensive exemplary records. I could find no complaints to the Better Business Bureau regarding BPS. I found no online reviews of the company anywhere I looked. As far as I am aware, BPS is a professional company providing professional services. Catterson’s background certainly sounds exactly like the sort of person one would want running a protective services company. That said, the sketchy contact information, low pay, and deceptive name are significant red flags in my opinion. Like I said at the beginning of this article, names are important. Redline Tacoma recognized that and did something about it. I doubt that Border Protective Services will be changing their name any time soon. Then again, since they lack an online presence, when people go looking for them, they are likely to find this article which clearly states that they have absolutely nothing to do with the United States Government or immigration enforcement. * Washington State’s Armed Security License requires that you be 21, have a current firearms certificate issued by the Washington State Criminal Justice Training Commission, and get a fingerprint and background check. UPDATE: I was able find the website for Border Protective Services. It does not have much more information than I’ve already shared. Last weekend my girlfriend and I decided to go to Pt. Defiance Park and walk some of the trails. It’d been months since I took the time to do so. 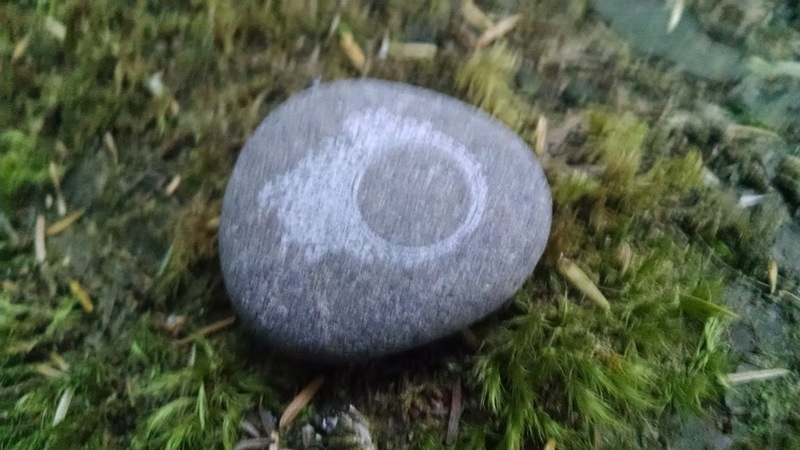 As we walked through the forest, I noticed a rock sitting on a log. It was obvious that it had not arrived at that spot naturally. Looking at the rock I noticed it had a little design on it. I thought that it was cool so I picked it up and put it in my pocket. 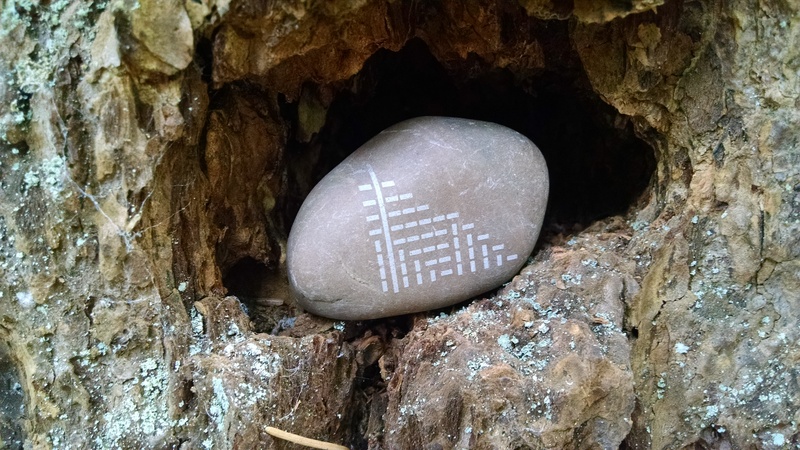 Then about fifty yards further down the trail I noticed another rock in a strange place with a different symbol on it. Once I figured out that it wasn’t just a one-off but some sort of mysterious public art project, I found another spot for the rock in my pocket and took a photo of each of them. As the walk continued we kept our eyes out for more rocks and found about eight of them, each with different symbols in what appears to be white ink stamp. Each time I took a (blurry) photo with my cell phone. Once I got home, I started looking online to see if I could find any information about these rocks, but a quick search didn’t find anything. I posted some photos of the rocks online on the TacomaStories Twitter and Facebook page. And then I decided to go back again the next day. The following day I found additional rocks on the same trail. I also found that some rocks from the day before were gone. Others had been moved. I took photos of every rock I found and decided to come back yet again. Today I went on the same trails as before but also some new ones. Some trails I found no rocks at all. Others I found quite a few. It would appear that they are not each unique designs. 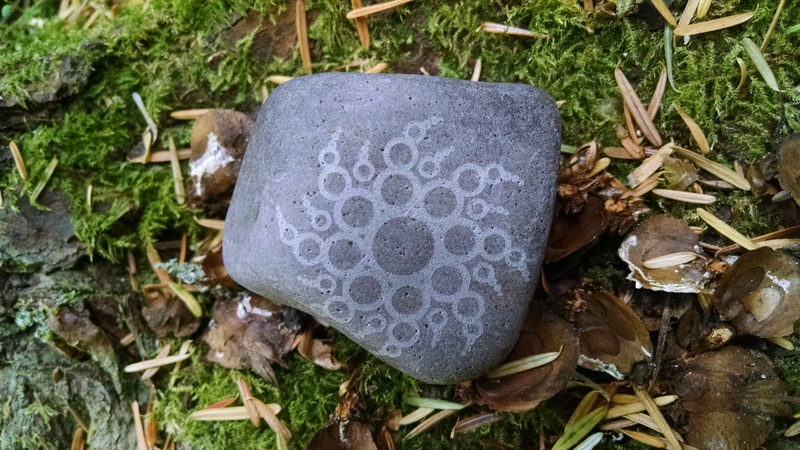 I found some identical designs on different rocks. Who is putting these rocks out there? Is there a meaning behind them or is it just art? Just how widespread are these stones? These are all questions to which I’d love to find answers. Unfortunately it’s almost impossible to determine whether or not the person or people who placed the stones are the same ones moving or removing the stones. The first stone I found was moved by me. Others likely disappear when people find them and pocket them. Are the new ones I find on the same trail new or just stones that were moved or I hadn’t noticed the day before? Someone or a group of someones has made exploring Pt. Defiance Park even more fun and I’d like to thank them for it. For more photos of the Pt. Defiance mystery stones, check out the Tacoma Stories Facebook Page. If you know anything about these stones, contact me at jackcameronis@gmail.com. I’d love to talk with you and perhaps do a 5 Question Friday. Enjoy the photos and if you’re in town, take the time to find some on your own. I highly advise that if you start hunting for these stones you employ the old adage, “Take only photos, leave only footprints.” In other words please leave the Pt. Defiance Mystery Stones alone for others to discover.